(340/1) 35–65 Mason Street; Ferris Hartman Theater and Hotel (unfinished, 1911), Hotel Ambassador (1922). Theater space redesigned as parking garage in 1922. 6B stories; brick hotel with steel and concrete garage; rusticated second level, quoins, keystones, cornice; three-part vertical composition; Renaissance/Baroque ornamentation; lobby: lounge space with square column order; storefronts: ground level pilaster order largely intact; corner neon blade sign “Hotel Ambassador”; alterations: storefronts, windows replaced, vestibule. Original owner: Prior Estate Company. Architects: Earl B. Scott and K. McDonald. 1911. 1922. Built on the site of the third Tivoli Opera House, the stately Hotel Ambassador has been beautifully renovated by the Tenderloin Neighborhood Development Corporation. 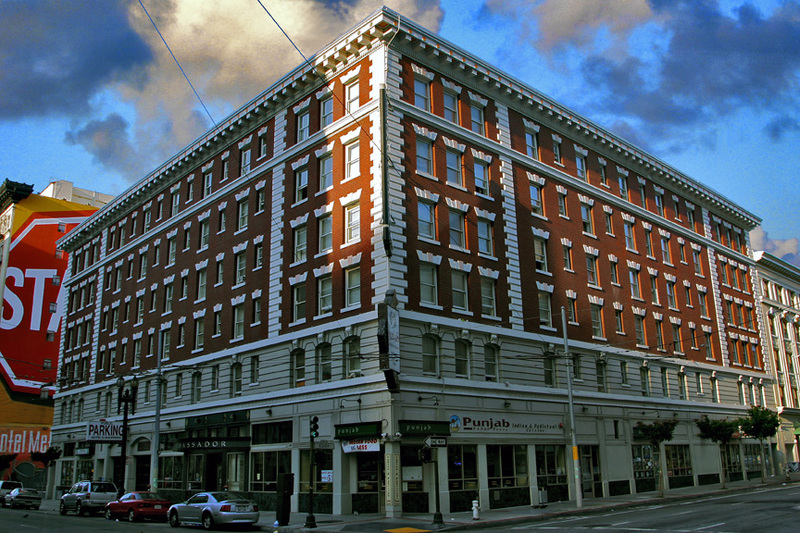 A legal dispute between the heirs of the original property owner and the Downtown Realty Company interrupted construction of the hotel near the end of 1912 and it remained unfinished until 1922, at which time the theater design was abandoned and a parking garage was built in its place. Front page illustration, San Francisco Call, 17 June 1911. A lead article about construction projects in the downtown district included details about the Downtown Realty Company’s new theater and hotel that was to be erected on the southwest corner of Mason and Eddy, naming William Beasley as the architect. The building described, however, is not the one that was built.
. . . the foundation and steel work for the new theater and hotel will be under way within a fortnight. […] The plans of Earl B. Scott, architect, have been accepted and a force of men has been excavating for the last week. Whatever happened to William Beasley and his design, the newspaper didn’t say. Mason and Eddy, circa 1911. Plastered with advertisements, a construction fence surrounds the empty lot on the southwest corner of the intersection. The building in the background is the Dale (Dalt) Hotel; in the left foreground is a corner of the Athens Lodgings (Bristol Hotel). The structural steel work on the theater and hotel . . . is now actively under way and the contracts for the entire structure have been let. The building is promised by the architect, Earl B. Scott, within six months. […] practically all of this building is already leased and the impetus that this structure has given to the Mason Street neighborhood is shown by the increase in values and the active demand for stores and hotels along this thoroughfare. San Francisco Call, 31 December 1912. A conflict between the Prior estate and Downtown Realty brought construction to a halt, placing the entire project in limbo, and the unfinished building stood empty for the next ten years. Ambassador Hotel, 1920. Blank windows stare and layers of handbills cover boarded-up storefronts of the unfinished hotel. Two more years would pass before construction was resumed and the building was at last completed. The Ambassador was the home of science fiction and true crime writer Miriam Allen de Ford from 1936 until her death in 1975. She is probably best known for her book The Real Bonnie and Clyde, published in 1968. I like to call this my “postcard view” of the building.